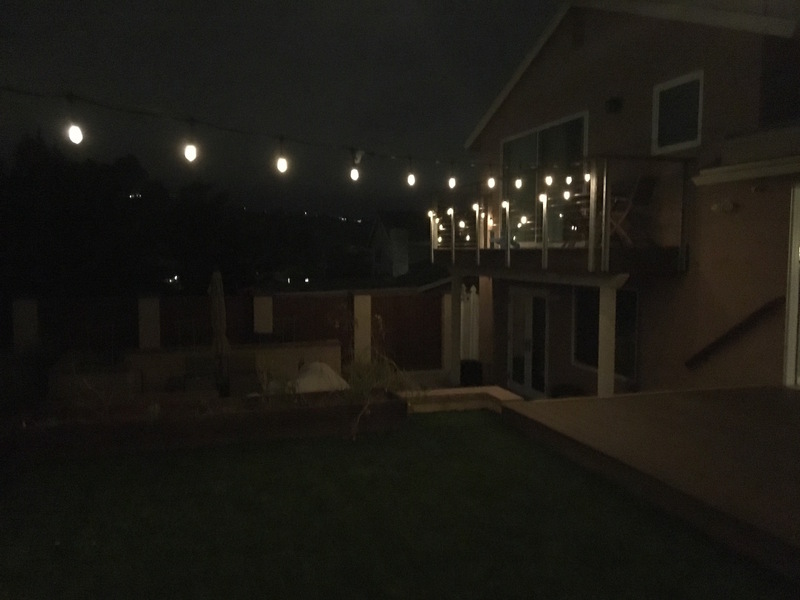 Recently my neighbor has been redoing his backyard and I saw that he put in low voltage lights around the perimeter of it. This made me a little jealous as I only put in low voltage lightning under parts of our deck and not around the perimeter. While I do have floodlights in the backyard, they are for security lightning and not really lighting the backyard when we use it. So, my choices for adding lights were quite limited. I remembered that Costco had some string lights, so I looked online and found some Feit LED string lights. I ordered 2 sets of these and they arrived last week. I chose these over the cheaper incandescent ones because of the lower power consumption, plastic bulb covers, and ability to dim them. After getting the lights, I strung them up without reading the instructions (what could they say besides plug them in?). They looked nice, but there was a lot of tension in the wire and the connection between the 2 sets had a lot of stress that didn’t make it secure. So, I decided to glance at the directions and it said that for spans over 24 feet, that the lights should be secured to a cable or wire. That made a lot of sense. This past Saturday, I prepared my parts list, went to Home Depot, and went about securing the wire rope to a pole, my house, and our deck. It was a clean install, just a bit time consuming. I then used small black zip ties to attach the string lights to the rope. One huge advantage of using the wire over just supporting the lights from the ends was that they didn’t sag. When it finally started getting dark, I turned on the lights and lit up the backyard. Even though the lights are about 15W each strip, they put out a significant amount of light. My wife loved them and I was pretty pleased with my work. The next evening we had friends over and we got positive comments about the lights which made me feel like putting up the lights was another good decision. The lights appear well constructed, are UL listed (the transformer/rectifier is UL listed for being rainproof, but I have it in an outdoor box with a cover). Put out a lot of light. Wireless remote to turn the lights on or off. For longer spans, an extra wire/cable is needed which adds to the expense and makes installation harder. Wireless remote seems a bit flakey. Colors other than the white are pretty useless. If you’re looking for a way to light up a backyard (or even a front yard), these lights should do the trick. I noticed yesterday that Costco sold them in the warehouse which would have saved me $10 shipping. Of course with anything plugged in outside, make sure it is UL listed. This set of lights meets that requirement for me. I’m quite pleased with the results and am not sure why I didn’t think of it sooner. Buying them from Costco made the purchase a no-brainer because of Costco generous return policy; there is nothing to lose by trying them. Lost my instructions, trying to figure out how to get different color combos, can you help? Thanks! We replaced our incandescent lights with these. Hoping to save energy, they are so dim. I was surprised you said they lit up your area. They act like xmas lights. Pretymuch just the lights immediate area is lit! Returning them! We actually turn down the brightness a little bit because of all the light that is output! In my configuration, the lights cover a lot of the backyard; my yard isn’t all that large. Good thing Costco has a generous return policy! Bought today, strung ’em up, and they are incredibly dim. We’ve tried using the remote to toggle through intensity with no luck. For us, we don’t want a huge amount of light. These aren’t flood lights, but give us enough light that we can walk around the backyard without falling over anything. Having problems… followed instructions to program the remote but the lights wont turn on, just blink. Power button on lights doesn’t work either. Anybody have the same problems? Yes. Just now. They worked great for a spell and then tonight they started the blinking. Did you resolve your issue? I would check that each bulb is screwed in tight. While none of mine have blinked, a few were just out and screwing them in tighter made them work again. As a last resort you can return them to Costco and get a new strand; I just saw them yesterday at my local Costco. Thanks I will give that a try. I don’t understand some of the reviews on here not liking the brightness of the lights. I found them to be perfect what I wanted to do. That is create adequate light to sit outside that I can adjust. The lights aren’t intended to be stadium lighting! We’re still very pleased with them and turn them on at least a few times a week. We just started having that issue, where you turn them on either with or without the remote and the lights just keep blinking steadily. Since we bought 2 sets, we replaced the power supply, swapped out the remote, and still had the same issue. Now they don’t turn on at all. Any suggestions? Unfortunately I don’t have any suggestions. My lights continue to work without problems. I would try screwing in each “bulb” a bit to make sure the connections are tight as sometimes I see some that go out and giving the cover a quick turn fixes the problem. You can always take them back to Costco; I saw that my local warehouse has them in stock so maybe a new set would help. mine just started blinking too. did you figure out how to resolve this? Thank you Scott… I installed 3 strands of the LED lights today and sadly, I am very disappointed in the brightness of the bulbs. I installed the lights at about 8’6″ and crossed the strands directly over our outdoor table, though I don’t even know if we would be able to enjoy a dinner out there, as we could not see our food. I will be calling Feit in the morning to see if they have any recommendations. My only other option would be to swap out for the cheaper non-LED sets and possible add a dimmer. All that being said, the overall quality of the construction of the lighting did seem to be amazing. I’m sorry that so many people are disappointed in the accent lights. For my purposes, they are excellent; I didn’t expect them to light up the night sky. For our small backyard, they do provide us enough light to sit outside and not be in darkness. We don’t know how to turn on the light I try the remote and nothing, I plugged in different ways and nothing happen. Can some body told me what can I do? The white lights are too dim when they are in the “steady on” mode. When they are flashing with the red, the white brightness is much brighter and actually sufficient for my needs….how do I get that brightness for the “steady on” mode. When I use the remote to adjust the white brightness in the “steady on” mode, it seems to only have one very small incremental change in light levels – both modes are significantly lower white light than in the flashing mode – is there something wrong with the control unit? I’m not sure I’ve experienced this, but I’m not looking for a lot of light out of the white. You could always pick up another set from Costco, test them out and return the ones you have if it appears defective. It’s possible that the flashing circuit does something different with the light level than the steady mode. I wish I had better answers, but I haven’t had any problems with the lights and am quite pleased. Hi Scott – Loving my set of lights although I can’t get the red ones to come on (not that it’s a bad thing I guess!) just annoying as all the others work. Any ideas? Red was working when I put them up initially – maybe I’ve loosened a bulb or something and that’s stopped one of them working? Any suggestions would be appreciated! I’ve found the remote to be finicky; I’d contact Feit and see what they have to say and if they might send you a new remote. Since I bought 2 sets, I swapped out the remote and things worked better and the controls were more responsive. You might try using the button near the plug as I believe there is a way to control the lights just using that; however, I can’t remember how. We experienced the same situation. Did you get it fixed? My red lights were working when we hung them and plugged them in on Sunday, and today they won’t work. Did you figure out how to get them to turn on? We are in the process of hanging our lights. Got two sets too. Used a guide line. Lights strung with zip ties. Now we can’t figure out how to connect the two strands. Any advice? At the end of one connector, there is a cap screwed on. Unscrew it and then you can push in the second strand and screw it on. How did you connect the strings? Mine appear to be female to female. There is a male type adapter but I don’t see how to connect it. On my strand, I unscrewed the end cap and then plugged the second strand into it after I disconnected the second power supply. I hope that helps. Perfect. Can’t believe I never looked at the power supply. Got them connected and hung. Thanks for your hlep. Glad I could help! Just about every time I turn on the lights, my wife comments on how she likes them! I connected on a single power box, 3 sets of lights with rope wire support secured with plastic ties. All bulbs would light up on all four colors for a day or two. Then after that, all three sets will only light up on 3 colors, no white. I have tried swapping control boxes (I have 2 other boxes), but gets the same result. This would just be fine for Christmas, but for the rest of the year, I only want white light for evening parties, which makes the system undesirable. Any thoughts? I only have 2 sets connected and just use the white light which works fine. My only issue is that there are sometimes a few bulbs that I need to screw in tighter to make the connection better. I’d try just using 1 or 2 sets and see what happens. Hi- did anyone have trouble connecting 2 sets and each set lighting up a different color? I used the connector but when I select white, one strand is red and the other is white. It’s like the settings are not synced up. Any help? Thanks! I haven’t seen this behavior and it seems kind of strange. I’d contact the company and see if they can exchange one or both sets. All lights in the strand work. Have you heard of this problem? And if so what is the solution? Thank you! I haven’t heard of this problem and my lights continue to work flawlessly. I’d contact the manufacturer and see if they can help you. I am using these lights on our front pouch under the awning. They are doing the trick for us. I wanted to use them for decorations all year around.. Right now we have the green on for St Patty’s day, Then for summer holidays we will use the red/white/blue combo. also Will love to use them when we sit outside in the front with the white lights on. Very good and works great! I haven’t seen this problem before. I’d contact the company and send them a picture to see what they say. Good luck! My lights hang below the wire. There is a small plastic tab on the top of each light that has a hole in it; I put a zip tie through that and attached the zip tie to the wire. The zip tie, however, probably won’t last more than a few years due to it breaking down from UV. I’ve gone through 2 sets the first set lasted a year figured it was the way we hung them and the snow over the winter. Hung a new set this spring and the quit working after 4 months. I’ve contacted the manufacturer we will see how they respond. Ouch! Mine are still going strong, but then again I’m in San Diego where we don’t get any snow and barely get rain! I have switched out the control cords and changed batteries on the remote control (I have 2 sets of these lights) and the remote controls (both of them) have had no impact on the light strings, even after installing new batteries twice. Remote is completely useless. Love the lights. Useless Remote control. The controller on the light string changes some things, though has no dimmer control. Again, useless Remote Control. I’m sorry for your troubles. I wish I had suggestions, but mine are working fine. If you haven’t contacted their support, I’d recommend doing that. Good luck!